It's not like Zach Laskey was doing poorly, but it's hard to ignore the production Synjyn Days has had. What Johnson said yesterday was that, it'll be a little like how he used Tevin Washington and Vad Lee in late 2012 - give both players snaps early and go with the hot hand. If Days keeps playing like he has, it'll be very hard to take him off the field. Matt Connors had a 55-yard run last year. David Sims' career long was 41 (also against N.C. State, coincidentally). But, to get at what you're saying, Days has peeled off a few long runs in a way that Sims or Laskey weren't or haven't been able to do. Second, what are your thoughts on B-Back? It seems like Days has done a fantastic job while in for Laskey and it will be hard to pull him. Do you expect Laskey to see much playing time the rest of this season? I can't recall a long run like Days' this past week since we had Dwyer or Allen? Whoa. this is like "Being John Malkovich." Shrimp corn chowder. No comment. What did I eat for dinner last night? Did I remember to wash my feet in the shower this morning? The AJC rolled out the website hoping to improve the experience for readers. I gather that hasn't been the response among many of you. I don't know what will change, but I know the people whose opinions matter more than mine are listening. I encourage you to write to feedback@ajc.com with your specific complaints. Ken, first off, what's up with the new website? Any chance that they'll do away with all of the popups and busy template? Thanks. Your encouragement helps keep me going. Gotta LOVE Kroger for sponsoring this weekly. Gotta LOVE Ken for doing a great job covering GT. Thanks. I sincerely appreciate it. that's an interesting theory. I think running up against the Virginia Tech/Miami/UGA wall has been pretty frustrating for Tech fans (you'd know better than I would). I imagine a lot of people have felt like there's been a ceiling. But it's not like fans were ever crazy about Gailey, even after Tech beat Auburn and Miami. This is why I got into the business. Probably equal chance and, since it's an open-air press box, hopefully the odor would dissipate quickly. I believe so. He only has a year of eligibility remaining (assuming he regains it) so he'd have to drop down to FCS. And if he wanted to leave, I don't think he'd spend the year on the scout team. As far as rankings implications go, probably not much. Tech got in the CFP top 25 last week for the first time after beating Virginia on ESPNU and then got into the AP and coaches polls after beating N.C. State on the ACC Network. If Tech were to beat Georgia, the appropriate people would know about it. This season has turned out better (so far) than I had expected and that's probably true for most people. However, at what point does continual losses to uga put johnson out of a job? Georgia Tech nose tackle Shawn Green’s status for Saturday’s game against Clemson remained uncertain as he continues to rehabilitate a knee injury suffered against N.
Not yet today. I wrote yesterday (I hope when I say this, I don't sound like, "Well, if you had been paying attention...") that Paul Johnson said it might be a Wednesday or Thursday decision. For what it's worth, Adam Gotsis thinks he's going to play. It's probably a combination. Quayshawn Nealy's interception was luck. D.J. White's interception was skill. Tyler Marcordes' sack/fumble was maybe a little of both - it's not every sack that causes a fumble - but it wasn't luck that Nealy was right there when the ball came out. I don't think the coaching points have changed in the last few weeks. I think sometimes it's a "when it rains, it pours" sort of thing. You'll remember that prior to the Pitt game, Tech had only recovered one fumble. Our defense has shown improvement lately to me. Not quite as much as stopping the other team but creating turnovers. Do you believe the recent turnovers are more luck and less skill or do you believe we're being coached up better to generate turnovers? I think pricing has a lot to do with it. You'll remember the Miami game drew well, as did Georgia Southern, although Southern brought a lot of fans. The cheapest tickets for the game are $75, although the ticket office is discounting upper north end zone seats to $50 today only. To me, $75 is a lot. Still plenty of tickets available for Saturday's game. Why do you think Georgia Tech has such an issue getting people to come to games? It is a big loss, without a doubt. Charles Perkins, Tony Zenon, Deon Hill and B.J. Bostic have all been contributors this season and past. Zenon, in particular, has really come on after not getting a lot of playing time in his first three seasons. A big load falls on Broderick Snoddy and Dennis Andrews, who've earned an increasing number of snaps lately, partly due to injuries. Another player to watch is Isiah Willis, a walk-on who's gotten a little bit of time, also. But, to answer your question, I guess we won't know, but that position group, under Lamar Owens, has turned out productive players each season. I had questions about whether any of the A-backs would step forward this season, and they've met the challenge, I'd say. Losing our top four A-backs after this season appears to be a big loss. Does Tech have sufficient talent to replenish this position for next year when the schedule gets tougher? Good morning. Thanks for joining me on the mailbag. I look forward to taking your questions. Let's get started. Addionally, why do we insist on copying other schools with a "white-out" especially in games where the predominate color for the other team is white. What kind of home field advantage is that for our players if they can't tell who is there for them? Time for a Gold Rush. In addition to fans in the stands, why do so many of our fans who do attend not wear the school colors to the game. I look across and see green, red, brown, etc. Seems to me a sign of an uninspired fanbase. For all those inquiring about coverage, GT does not have the audience that UGA does. We are not as big of a sports school as they are. GT is an amazing research institute with a football team. UGA is a football team with a couple of classrooms around their stadium. And what about when Tech plays Mercer in 2016? 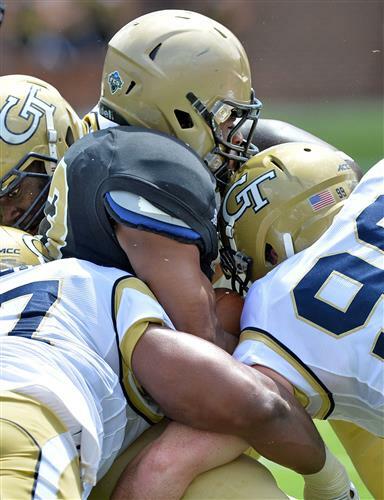 Do you think that Tech will ever play GSU or Kennesaw State? I always like to read that. Thanks. I completely agree with you, Ken. Funny. I'd think it's at least a Tech record, if you want to call "most points scored in the first 5:14" can be considered a record. The record for largest first-quarter lead is 28 points, and I think it's safe to say Tech didn't score all 28 points in the other games in he first 5:14, though I don't know for sure. It's too bad there's not much of a record of the Cumberland game. Tech scored 63 points in the first quarter of that game. I wonder if Tech got to 28 faster against Pitt than it did against Cumberland. Its going back a couple weeks, do you know whether scoring that 28 points against Pitt in the first 5:14 was some kind of modern day record? Good question. Paul Johnson is usually unsparingly honest and you're often not sure how he'll answer a question. he is also a pretty good storyteller and has incredible recall. Mike Sewak (offensive line) is also very honest and detailed. Mike Pelton (defensive line) is the same way. Who's your favorite coach to interview? I was speaking specifically of Tech fans, but I agree with the balance of your comment. Even for the Miami game, there was a decent number of people wearing green and orange, most of whom had horrific tattoos and terrible facial hair. I forget if I read this or maybe I'm just totally making it up, but it does seem to me that Tech's base in the triangle is one of the largest in the country. Hopefully it'll be an enjoyable afternoon. Headed to Raleigh this weekend. Hopefully, Tech fans will be there to support their team. Lots of alumni in the area. Should be a good time! The problem with that is that Tech has a committed base of maybe 22 or 23,000 season ticket holders who are willing to pay the price of a ticket, and maybe even more. So if you lower all the ticket prices, then you have to lower it for season ticket holders and then you're losing revenue that way and kind of gambling that the lowered ticket prices will in fact draw sufficient attendance to make up for the lost revenue from season ticket sales. This is sort of off topic but Tech, like probably a lot of schools, is dealing with the fact that its season-ticket base is graying, and younger alumni and fans are less likely to take their places. Tech has to lower the ticket prices to make the place full. I guess it's all in how you look at it. It's kind of like what i wrote about Ricky Jeune and players in general. I think so much of what happens to a player (and I guess this is much more broadly true) is his willingness to push himself. I get the strong sense that he isn't there yet. In his defense, I think the fact that this is only his fourth year of football probably plays into it. What is going on with Francis Kallon. Raw, but highly recruited out of HS. Seems he should be further along and more of a factor at this point? I'm sure it was a factor. The Virginia attendance wasn't as noteworthy to me as the Duke attendance. He has a left-leg injury. He had to leave the Virginia game on a cart and hasn't practiced this week. I'd suspect he won't play Saturday.